"A good symphonic power metal album without great surprise but without disappointment." Rhapsody Of Fire is the band of Alex Staropoli and Fabio Lione, but without Luca Turilli and the others. You can spot yourself at first listening by recognizing the singer. En fait... no, Rhapsody Of Fire is Alex Staropoli's band because for this new album Fabio Lione is no longer part of the band, probably too busy with Angra and obviously a certain Turilli Lione Rhapsody, coming soon. Enough to get lost in. Also note the replacement of Alex Holzwarth on drums. 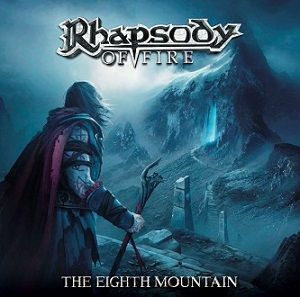 So it was with a new singer named Giacomo Voli that Rhapsody Of Fire continues his adventure. A breath of inspiration had characterized "Into The Legend", which continues with "The Eighth Mountain". The change of singer and drummer did not allow the beginning of a stylistic shift. The first single 'The Legend Goes On' presents the interest of getting to know Giacomo Voli. Significantly less twirling and less powerful in the high notes than his honourable predecessor, he largely does the job and perfectly embodies the melodic effort that underlies all the songs present here. The ultra classic symphonic power metal of "Rain Of Fury" is a delight as the medieval ballad "Warrior Heart" with its catchy melody or "White Wizard" which is particularly effective. The rather nervous production leaves a special place to Master Staropoli and his keyboard but does not put aside the rest of the band. This avoids the very strong emphasis of Turilli's latest productions. Note the epic "March Against The Tyrant" which is particularly successful in its construction, its increasing power and its catchy aspect, as well as the other long piece that ends the album "Tales Of A Hero' Fate" which ends with Christopher Lee's (too) long and deep declamations. A nice album in the end, with some little lengths but which constitutes a very pleasant series of well done songs, well interpreted and which do largely what we expect from them, namely to have a very good time of symphonic power metal.